These short documentaries invite us to look to our past to help paint our future - from childhood memories of Chinatown sculpting character to battling the myths of mental illness as they are often misunderstood in the Asian American community. ROOTS AND REFLECTIONS provides an introspective view on how each of us is empowered to use our individual experiences to collectively impact our world. Wu Yuzhang Honors College of Sichuan University with a Bachelor’s Degree in Environmental Science. Marrying her passion in visual storytelling with the purpose of initiating social changes, she started making documentaries. In 2016, her thesis film in the MFA Documentary Program at Stanford No Harm No Foul tries to probe into a systemic problem of lead contamination in America’s drinking water through a story of corrosion, coverups and the corruption of science. Currently she is collaborating with her colleagues from Stanford to expand her thesis project into a feature-length documentary. When two students competing for a music scholarship discover that their original compositions are based on a single family song, both are determined to prove ownership, leading them to uncover the long lost true origin of the melody: a story of salvation and hope when over 20,000+ Jews emigrated to Shanghai during WWII. During the course of his meal, a loyal patron reminisces into his past memories at his favorite restaurant one last time. 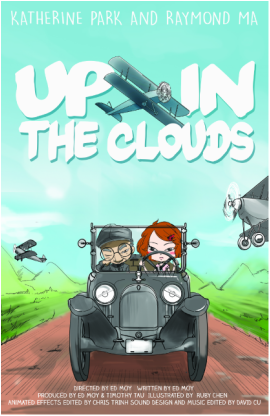 Loosely based on the story of Chinese Aviatrix Katherine Sui Fun Cheung, Up in the Clouds shows how as a teenager, she discovered her love for flying while learning to drive a car with her dad next to a dusty airfield in 1921. A story of a Cambodian refugee's journey through the Killing Fields produced the form of an interview between mother and son. WILLIAM CHOW is a senior at Harvard-Westlake School in Studio City, California. He is a first-time filmmaker and is the son of Jenny Yam, a survivor of the Cambodian Genocide in 1975. In 2016, he traveled to Cambodia to meet the people who saved his mother, and retraced the steps of his mom’s childhood. The story of that journey is chronicled in the film Angels and Demons, which was created in collaboration with Jeff MacIntyre, an Emmy Award-winning journalist. JAMES Q. CHAN is a San Francisco-based filmmaker who has collaborated on Emmy- and Grammy-winning projects. James received his film training through the mentorship from two-time Academy Award winning filmmakers Rob Epstein and Jeffrey Friedman (The Times of Harvey Milk, The Celluloid Closet, Paragraph 175, Battle of Amfar). ​From 2000-2011, James managed the day-to-day operations of Telling Pictures, Epstein and Friedman's San Francisco Production office. His producing credits with Epstein & Friedman began on The History Channel's 10 Days that Unexpectedly Changed America (Emmy Award; Outstanding Non-Fiction Series) to Howl (Sundance 2010 Opening Night; Berlinale; National Board of Review's Freedom of Expression Award). His recent producing credits include Puck (Dutch broadcaster IDTV and VPRO Television), a feature documentary about an extraordinary child protégé from The Netherlands who started programming at the age of seven and within a few years has won both Apple and Google’s design competitions; ISTINMA (Best Short, 2014 American Indian Film Festival; Smithsonian Institute Native Showcase); Entry Denied (2012 Provincetown Int’l Jury Award Documentary Short); The Bridge (Frameline; Los Angeles Int'l). ​Prior to independent films, James worked as a SAG/AFTRA union Talent Agent in San Francisco. His successful track records for identifying and nurturing emerging actors elevated JE Talent Agency (formerly Mitchell Agency) to become one of the top three talent agencies in the San Francisco Bay Area.